I am so excited to show you this recent living room I did for an e-design client. She has a beautiful home that needed to be freshened up. She had some existing pieces (wall color, linen colored drapes and linen colored sofas) that she wanted to keep. She loves a global look but still traditional. She wanted calming colors but also loved blue. The room gets great light and connects to the entry way and her dining room. Here is the floorplan I came up with to optimize seating for entertaining and for the flow with the entry and dining room. Here is the inspiration board! I love it!! I wish I could transport it to my home right now!!! ANNIE!! You must be psychic! It's like you read my mind and brought in things I had been thinking of but never expressed... I love the blues and all the additional lighting you brought into the space... We have already moved things around and love the new floor plan! Thank you so very much from all of us. Gorgeous! Your clients are going to be so happy! Thanks so much Sita. It was fun to work on! I love your inspiration board - great rug and love the mirror!! Thank you! 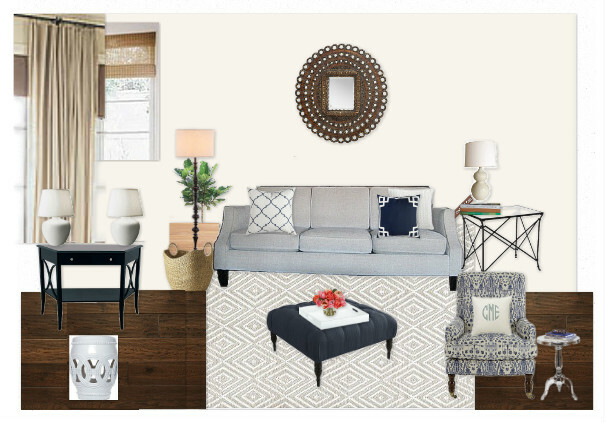 The rug and mirror are some of my personal favorites as well! Hi! Welcome to my blog. Thanks so much for visiting!